Paideia went punk. Junior physics major Julia Selker organized Punkdeia at an off campus house the Wednesday of Paideia 2014. Completely autonomous from Reed, Punkdeia was a daylong progression of Paideia-style classes, several of which would likely not have been approved by the administration. But first some history. Julia was embroiled in the controversy that racked Paideia last year. As Paideia Czar for the 2013 Paideia, Julia had been responsible for all of Paideia. She collected and went through the proposed classes and met with Community Safety and Facilities Services who looked for safety hazards and ensured that no buildings or trees would be damaged. The CSO check was pretty rudimentary. They made sure the liquor courses would check for IDs and the teacher of the straight razor class wasn’t a budding Sweeney Todd. Julia published the 20-page Paideia schedule, which was available for almost a full week without any complaints. This is when Kroger ran headlong into his first Reed controversy, ordering that a fermentation class cut its alcohol component and that two other courses be cut entirely. Kroger was as heavy-handed as he was hands-off, delegating his pronouncements through intermediaries. In Julia’s opinion, the most objectionable part was how he passed off contact, first to Kristin Holmberg, Director of Student Activities and then to Mike Brody, Dean of Students. Kroger’s main line of reasoning was liability: the school could be held accountable for what was taught in Paideia classes. The Paideia controversy attracted the attention of alumni, many of whom saw the controversy as the latest emanation of Administration vs. The Student Body. The backlash built until Kroger scheduled a Reed Forum. He responded to student complaints and Olde Reede territorialism in reticent, lawyerly fashion. But that’s old news. But the bureaucracy had started to wear on Julia. Liability was the new buzzword, and hardline mandates would hamstring what classes could be conducted. If anyone was injured in any way, and it was found that the student had learned about what harmed them in a Paideia class, even if it was just possible that they had learned about it in a Paideia class, it could be really bad for the school. At this juncture, Punkdeia was born. The “Punk” is about an ethos and not a genre of music, harkening to grass roots and defiance toward authority. Though the school would likely not have approved some of the Punkdeia classes, none of the Punkdeia activities were inherently illegal. 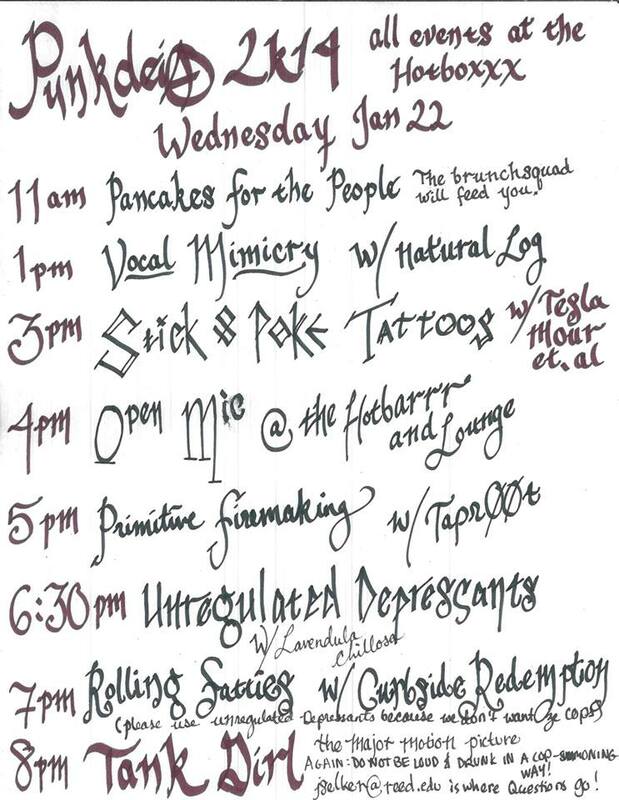 The pseudonym-wielding Tesla Maus taught a class on Stick and Poke Tattoos, which are permanent tattoos that are almost as simple as they sound. Participants took sterilized needles, wrapped thread around them, applied ink and repeatedly stabbed someone until they made a tattoo. Though some practiced their tattoo making on oranges, others went in for the real thing. A mini pentagram was tatted to a finger; whales and trees took to arms and a lion landed on a wrist. Classes and activities filled the day. A fire starting class lit up the back yard and Curbside Redemption taught a rolling class. Unregulated Depressants, the class that had been canceled when it had been called “Put This in Your Pipe and Smoke It,” was held, Kroger unwittingly gave the course its title in his letter to the community about Paideia last year. It turns out that by “unregulated” they mean completely legal to purchase and use, and by “depressant” they mean mellow—sort of like how alcohol is a depressant but with a less intoxicating effect. We ended up on the back porch taking turns sharing poems. Someone sparked a J. “Try this,” they said, offering it my way. “It’s not marijuana,” he said. “It’s a bunch of other herbs: lavender, mugwort and mullein leaf.” The smoke was pleasant. As I relaxed into a mellow sensation, I realized that I held in my hand the root of last year’s controversy. I exhaled. So much fuss over this?